"Did you know that even when you do something bad, really bad like what happened today, that your mom and dad will not run away and they will still love you?" My kids did something bad yesterday. Really bad. Patrick made some really bad choices. Caroline helped instigate it and Mary Kate got in on it a little too late. All the way around it was bad, with a capital B. There were a lot of tears...some yelling and the ever present, awkward intruder who always makes his presence known as the unwanted houseguest he is, blame. There was no getting around it. Patrick had the choice between right and wrong and he chose wrong. When I asked him why he would choose wrong he told me an honest truth: "Because I wanted to." Since that is usually the reason we all choose wrong I wasn't surprised by his motivation -- just a little bit stunned at his candor. I had my lecture all ready for being honest and telling the truth...he beat me to it and spoke the truth. I had to change it up and talk about why we must stop ourselves and choose right and refuse to do the things we want to -- especially when they are wrong. I had to hold up the mirror to his moment and help him see how it was wrong...had to help him see the dark side within himself...and those of you who think people with Down Syndrome are "angels" who are "happy all the time" and are "pure" and can never make wrong choices well...you might want to rethink that. I have seen Patrick be sneaky, dishonest, and even a little mean. It's not very often, but it's not an impossibility. I remember the first time he tried to manipulate me, he was only five. I smiled and cheered inwardly...it was age appropriate and fantastic! He was trying to find a way to get his needs met and he knew I was going to shut him down. Like any ordinary kid, he tried the sneaky way. It didn't work but I was proud of the effort. As Patrick begins to navigate the older world, the stakes are higher. Like all teenagers, he can mess it up big time. But just because he has Down Syndrome doesn't mean that he should be protected and prevented from blowing it. My tolerance for my kids making mistakes has grown. When my kids were younger I wanted to be the buffer between any misfortune and my child. I wanted to point out the obvious pitfalls and have them avoid them. Now I know that this is where the real learning takes place. This terrible time, between the tears, the apologetic hugs, in the thick of feeling forgiveness and regret is where the character building happens and where kids decide what kind of person they want to be. We had a long conversation about making the hard decisions...about choosing right even when no one is watching...about knowing the differences and following through. It was sad and bad and pit-in-the-stomach queasy but that is what parenting is about. It's about seeing the dark side and facing it head on. It's about confronting a problem and not sweeping it under the rug. It's about holding up a mirror to our children and ourselves. It's a hard, hard road but one I'd never miss. Caroline's take away from that hard day was both heart-warming and heart-wrenching. No, moms and dads are not going to run away. We're here to stay and yes, we will not let you choose wrong. We're here to make it clear and help you become the person you are meant to be. We're sticking around and seeing this through. We love you, mistakes and all. So today I'm grateful that I get to be here, day in and day out, helping my kids learn how to be good, kind people...even when they are learning it the hard way. "...there is no such thing as a charmed life, not for any of us, no matter where we live or how mindfully we attend to the tasks at hand. But there are charmed moments, all the time, in every life and in every day, if we are only awake enough to experience them when they come and wise enough to appreciate them." I used to have a seriously awful relationship with laundry. I detested it and I was pretty sure that it detested me. It smirked at me, filling immediately upon emptying out. It mocked my attempt to control it. It dominated my pitiful efforts and constantly reminded me who was in charge. It was overwhelming, unruly and very disobedient. Kind of like a dog with no manners, my laundry spilled out everywhere, climbed up on me when I tried to shirk it away and constantly hounded me. All that changed in just one moment. My mom was taking care of Jack and Mary Kate for me while I was at a hospital appointment with tiny baby Patrick. I came home and my mom was doing my laundry...putting it away, folding it in her careful way, organizing and helping. I must have had a look on my face of angst or sadness and my mom asked me some sort of question about the laundry. I just started crying. I told her what was in my heart, "Don't you see? I just want to be doing what you're doing...just taking care of the kids, doing my crappy laundry, myself. I don't want any of this hospital stuff. I just want to be here." Suddenly laundry looked pretty good. I made a mental note in that moment to never take the ordinary, mundane, insidiously repetitive household chores for granted. You see, if you are doing those things, your life is pretty great. You have a family that needs tending, children that need cleaning, and the ability to get it done. Laundry became my indicator of just how good our life was. Full to the brim meant a full life for me. I looked at those clothes, towels, sheets and blankets as the stitches of my daily life and the chance to clean them and put them away as a neat hem on a gorgeous wrap around family blanket. Finding baby clothes in there once again became a secret gift. Onesies, footy pajamas, the occasional binkie all reminded me of the fleeting moments of babyhood. I mark time with the laundry...finding sports jerseys, school uniforms, seasonal kitchen towels and even the university T-shirt that would never would have been in my pile except that Jack spends his days there now. Like all of life I can see the change in my world by the size of my pile. Soon enough Mary Kate will be doing her own laundry far away from here and my pile will get even smaller. I find peace in the pile...comfort in the folding and organizing and the joy in having a family and a giant-sized Mount Washmore, as my friend with six kids affectionately calls it. I know all too well that this time of family laundry is only a season of life. Even though that season feels forever-long; it ends. 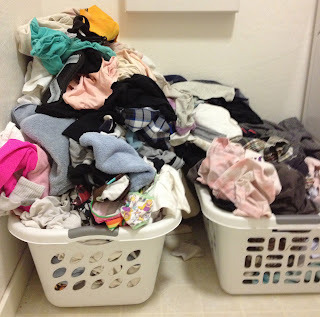 So today I'm grateful for the overflowing laundry basket -- happy to know John's raggy old favorite T-shirts, comforted by the Rapunzel underwear and reminded by the larger and larger socks and pants of my growing kids just how quickly it goes. I'm grateful to have a family -- Mt Washmore and all. "We are cups, constantly and quietly being filled. The trick is, knowing how to tip ourselves over and let the beautiful stuff out." Patrick has been working on a play through our local Art Center with about ten other kids. They have met twice a week for the past four weeks with the goal of creating a script together, figuring out the blocking on stage and performing a play at the end of that short time. Day one, the kids brainstormed Heroes and Villains. The list of heroes included: Hercules, Wonder Woman, Goldilocks, Robin Hood and my personal favorite, Hermione Granger. The list of villains went as follows: Cruella de Ville, The Wicked Witch, The Evil Queen, Captain Hook and The Big Bad Wolf. Wanna take a guess who Patrick wanted to be? Patrick, lately, has been having fun imitating the bad guy. Whenever Caroline and Patrick are playing I can hear Patrick trying to set up the plot so that he can be the villain. He's interested in seeing the other side of things...being a little dangerous, kind of shady, trying out those things he knows aren't acceptable anywhere else. 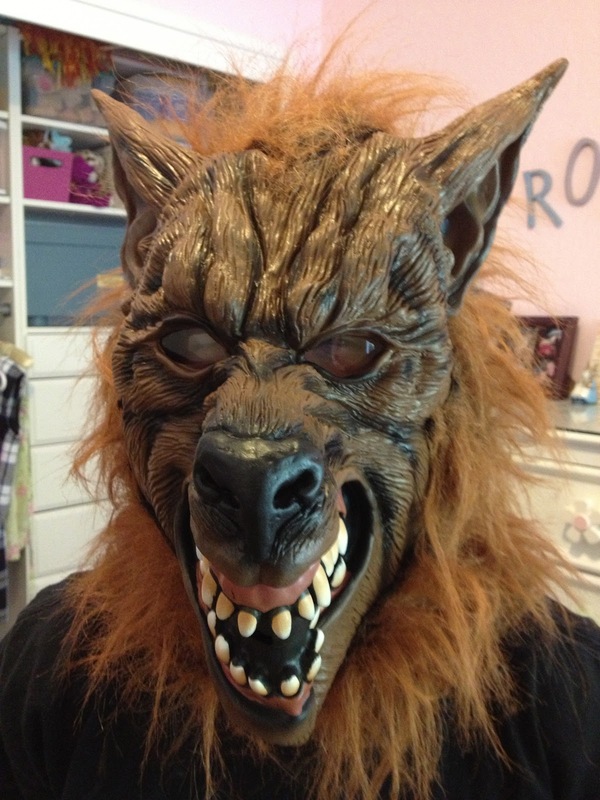 He coveted the role of the Big Bad Wolf. He came home after only two days with an official script. He carefully read through it and highlighted his lines. He had them memorized that night. He couldn't wait until the next practice. Patrick is thirteen. Although he has Down Syndrome, there is no doubt that he is ready for more opportunities without me around. He doesn't need me escorting him right to the edge of activities. He knows it and I know it. The only problem is actually living it. It feels extremely weird to leave him alone waiting for his activity to begin. I want to make sure it is all settled and comfy for him but he clearly doesn't want that. He flicks me away like an annoying bug, telling me: "I know, mom, I know. I'll see you in a little while. I'm fine. You can go." He's sooooo thirteen and I want to go, really I do. I know he needs me to go. But there's no rulebook to follow in this world of teaching independence and bestowing confidence in your child with a disability. It's hard enough to navigate with kids who are pretty typical. It's downright terrifying to let it unfold here with him. What am I afraid of? The big, bad wolf? If I want him to have a life of his own, I have to let him. I have to show him the cracks and stumbling blocks; point out the safe zones and sure fire ways to get help. I try to think up unforeseen circumstances and give ideas of how to deal with them...but like my other two older kids I know I can't think of everything. I know this process is like shedding skin. It comes off piece by piece...the new skeleton ready and strong. We have to believe it is there and wait and watch. I drop Patrick off at his class ten minutes early. The universe has conspired to help me on my path of letting go -- Caroline has something that starts at the exact same time somewhere else and we need a bit of traveling time to get there. I try to linger. Patrick does the teen brush off. He has already started talking to a friendly face. I tell this other child my situation and he lets me know that he will hang with Patrick until things start. I sigh and head out...wishing I could be in two places at once. Wishing for some sort of secret camera to transmit data to me...wishing I could have one for my son at college too. But what's the point of freedom if you have a leash? We have to put ourselves out there. Out in the big bad world with the villains. We have to see if we have the hero within us and afford ourselves the opportunity to let that hero out. The sad truth is that the hero never shines if his mother is hanging around. Or maybe that's not so sad. If I want my son to have dreams and passions and hopes of his own, then I need to walk the walk. Although I will admit that Rapunzel's tower is making a lot of sense to me right about now. So, Patrick worked with kids and together they wrote a script. They had heroes and villains and Patrick was the Big Bad Wolf. He rattled off his lines at home and together we searched for a legit wolf mask -- finding the perfect blend of frightening and realistic at our local Target store. He loved it! Yesterday, after only a handful of practices, was the performance. No one knew what to expect. Caroline, Mary Kate and Sarah (Patrick's aide from school) showed up to a minimalist set and some folding chairs. The kids begin. It's a clever script with twists and turns and a general feeling that the good guys might not be all that good and that the bad guys might be nicer than you think. The villains vamp it up with a certain wolf very in touch with his angry side. He growled. He smirked. He was Bad with a capital "B". The show crescendoed with a wild fight scene. The lights were blinking on and off. The hand to hand combat was hilarious -- suddenly the action stopped. The wolf was gone. In his place was Prince Charming. Magically, he is transformed. He rises from the attack and whips his red robe and looks majestic and strong. The audience, happily surprised, roars its approval. A hush settles over the crowd and the last few lines are said. The details might be missing but the message is loud and clear. We all have a beast we are fighting. We all have something charming within. It's our own journey to discover it...our own life's work. No mommy can do it for us. And the bigger message that hit me like a set of high beams: maybe this group of kids first saw Patrick as some sort of monster. Maybe this group wanted him growling and fierce. Could it be that by working alongside on a project together that they could finally see the prince within? Aren't they the ones who allowed the script to have a happier, nobler ending? No adults wrote the script or acted it out. It was a group of kids who together, inclusively, found their way...a group of kids who acknowledged the villain in each of us and the hero ready to transform. Notice: no mommy was a main character. I'm getting the message. My job is to be in the audience...to show up. My job is to provide the opportunity to stumble -- the chance to rise from defeat, a prince. The challenge is to stay in the wings...letting the beauty spill out and relishing the view. I'm up for the challenge...ready to find my own inner hero and begin the transformation from mommy to Wonder Woman -- or better yet, Hermione. Now I just need to find my wand.